Like the above pecking bird, the reference for the pecking chickens comes from a twentieth century book on German toys. To play with the toy, you hold it by the handle and let the weight hang freely below the paddle with the chickens. 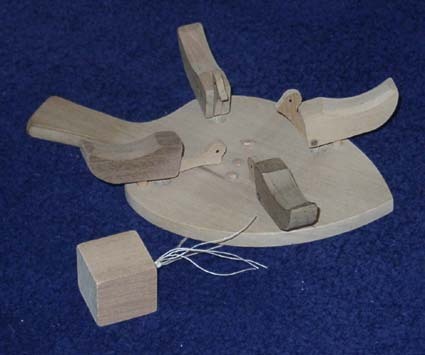 The toy is then moved so that the weight swings in a gentle circle and cause the chickens to peck in order around the circle.